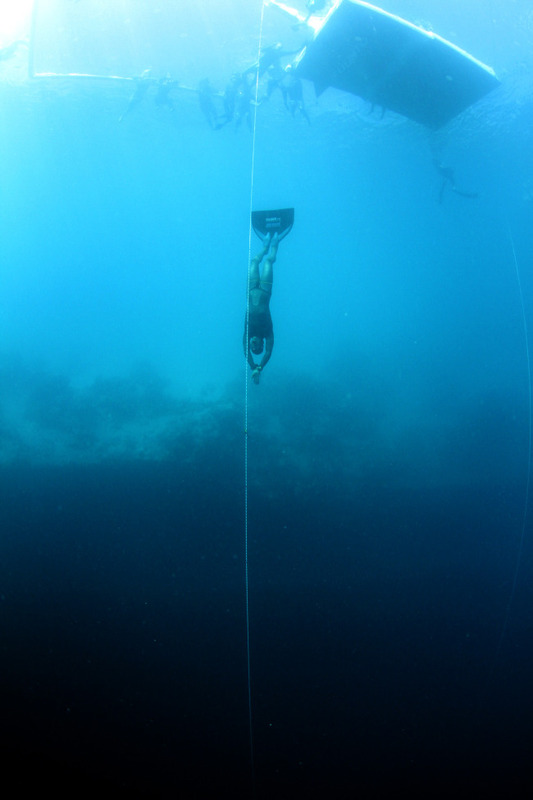 The first day and first dive of Suunto Vertical Blue – Dived 100 meters and then blacked out on the surface! Sounds quite bad but actually I enjoyed the dive and a lot of things went right even though the result was not what I wanted. I arrived here 8 days ago having not done any dives over 30 meters for over 8 weeks due to the ruptured ear drum that I suffered in Kalamata, Greece at the World Championships. During the 8 days training here I managed to do 80m CWT, 80m FIM, 84m CWT, 85m FIM, 88m FIM and 94m CWT. I was pretty happy to be back down to some good depths after so long away from deep diving. All the dives were clean with no hypoxia issues. With only 8 days (including rest days) before the competition I had not had a chance to experiment with some changes to how I dive, so I still had to try some new things on this first competition dive to see if I could effectively equalize to the depths I wanted to go. I did two warm up dives, both full lung, pulling down to depths of 34m and 32m with dive times of no longer then 2’30. This took me up until 15 minutes before my official dive time (OT). I felt pretty relaxed in my head at this stage and was managing to block out the voices of the judges and conversation of spectators and safety divers in the water around the competition diving area. I decided to stay breathing through my snorkel and keep my head in the water right up until 1 minute 30 before my OT so that I wouldn’t get distracted by the voices and conversation. This was a mistake as I generally over breathe when using a snorkel and I had not been doing this for any of my training dives! When my dive time arrived I packed extra air (25 packs) and started the dive. The first 25m went quickly and smoothly, 15 fin kicks and then I was in to freefall and taking my mouth-fill of air that would keep me equalized on the deep phase of the dive. I continued topping up the mouth with air as deep as I could and then settled in to the deep freefall. I was concentrating on being soft in my body, trying to let myself melt in to the water, feeling the speed increase and the water rush by. Everything was going well; equalization felt strong, body and mind felt relaxed. I had been falling for what felt a long time, I was getting low on air in the mouth to equalize with, and was starting to wonder if there would be enough when I heard my 95m alarm, managed another equalization and then hit the bottom plate. I grabbed for a Velcro tag and started the ascent. I kicked strongly off the bottom, perhaps too strong and then everything seems less clear. On all my training dives I had felt very clear coming off the bottom but on this dive I have little memory of the ascent. Visibility was still bad in the Blue Hole today and this means that it was still very dark till quite close to the surface. I think a combination of narcosis and total darkness affected my ascent in some way. I remember the safety diver (which would have been at about 25-30m), and then I slowing down as I thought I neared the surface. In fact I slowed down too soon and ascended the final 10 meters far too slow. As I ascended my thoughts went fizzy, everything closed in and I remember trying to push back through this feeling but being unable to, only to find myself already on the surface being supported by the safety divers. Hard to say exactly. I took my heart rate before I got in the water and it was 72 beats per minute instead of my normal 52-60 beats per minute. Even though I was convincing myself that I was relaxed and calm my body was not falling for it and I was feeling competition nerves! I was also diving a little too heavy as I had switched to diving with a thinner 1.5mm suit instead of my 2mm suit but was continuing to use the same neck weight of 1.5kg. However the biggest factor I think was probably over-breathing. I started my breathe-up far too early and probably lowered my CO2 too much. So, next dive will be an easier and shallower free immersion dive on Day 3 to rest the legs for another attempt at 100m in a few days time on Day 4. It’s a long competition with a lot of dives and a lot can change during it for good and bad. Athletes can continue to improve due to short term training effects and decreased nerves but the fatigue can also build up towards the end. I managed to equalize all the way to the bottom plate on this dive, the first time at this depth! So at least I have found a way around the problem that caused me to rupture my ear drum 9 weeks ago, and the newly healed ear is holding out too …. no leaks! !